Support our Troops Reviewed by Edgeville Buzz on September 16, 2010 . Did you know that there are close to 159,000 American servicemen and women deployed overseas in defense of our country? Many of these troops are living in very difficult conditions with few, if any, comforts of home. Operation Support Our Troops of Illinois (OSOTIL) puts together care packages all year long for the troops. 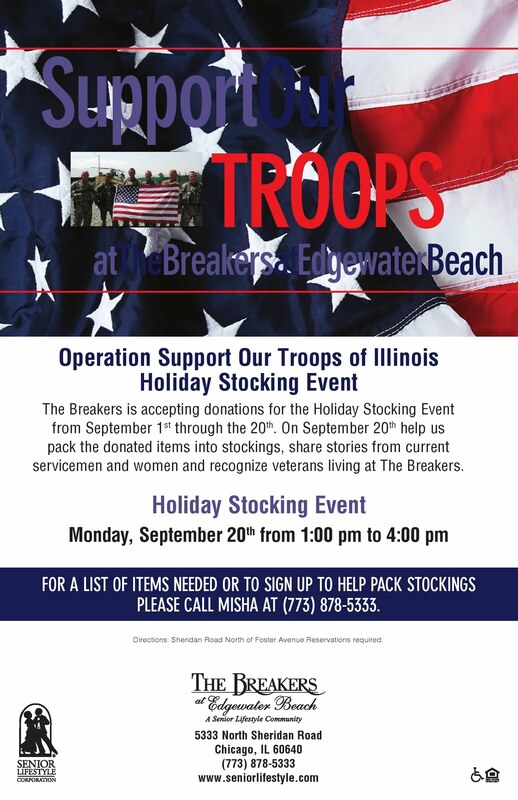 This year, OSOTIL and The Breakers are joining forces to put together holiday stocking care packages for the troops. To sign up to stuff stockings or to make a donation contact Misha at 773-878-5333 ext. 230. Items can be dropped off in the lobby of The Breakers.